Keep your wine chilled to perfection with the Koolatron 10 bottle. The removable stainless steel wine racks allow you to customize the cellar. Elegant, built-in soft lighting makes this wine cellar the perfect show piece in any kitchen, den, or home bar. Perfect for the home, office, games room or dorm room, the countertop Coca Cola Display Beverage Cooler is the must-have for any Coca Cola fan. It features the iconic Coca Cola polar bear design and has a large capacity that fits up to 28 standard cans. This mini fridge comes with 12 volt DC and 110 volt AC plug, so you can power it from any household outlet or plug it into any vehicle 12 volt plug. The Coca Cola Display Beverage Cooler uses thermoelectric technology to cool your food and drinks up to 35F (19 C) below the surrounding temperature. Thermoelectric cooling is efficient and operates without any noisy compressors. Use it in HEAT mode to keep pre-cooked food or drinks warm. Heat mode will warm the contents up to 140 F. This beverage display fridge also features simple, front access LED controls so you can adjust and view the fridge's internal temperature with ease. Use the interior light to create a special display effect. Stay refreshed with the Coca Cola Ice Chest Cooler Make a statement with this fun and functional Coca Cola ice chest. The 13 L capacity keeps up to 18 cans ice cold and ready to enjoy, and the thick durable liner makes this cooler easy to clean. The bold, retro Coca-Cola design makes this ice chest an eye-catching accessory for any home, garage patio, boat, or RV. Cool up to 18 cans or 12 bottles at a timeCan't find a bottle opener? No Problem. There is a built-in bottle opener attached to the side of the cooler. This Coca Cola Retro Ice Chest Cooler has a 13 L capacity. It features a locking handle to help keep the contents from spilling. A must-have for Coca-Cola collectors The compact Coca Cola 13L Vintage Retro ice chest cooler is ideal for use at your next picnic, on a road trip, or keep it in your garage, shop or at the campsite. This cooler has a metal exterior and painted finish. 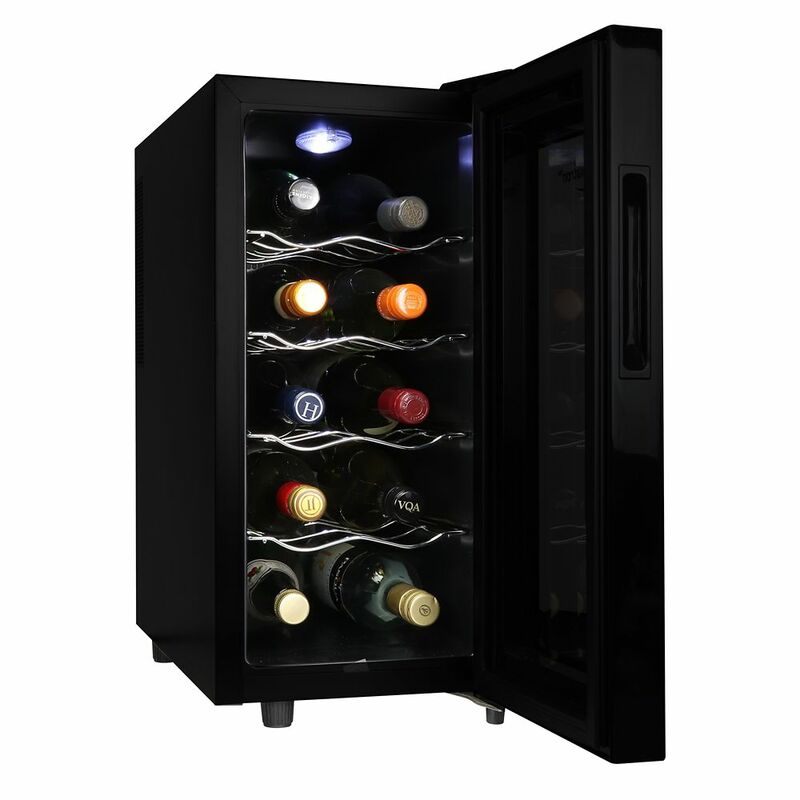 KWT10BN 10-Bottle Wine Chiller Keep your wine chilled to perfection with the Koolatron 10 bottle. The removable stainless steel wine racks allow you to customize the cellar. Elegant, built-in soft lighting makes this wine cellar the perfect show piece in any kitchen, den, or home bar.